A wonderful story about Skippy Norma!I loved how he tried to knock the monkey of his back with the rungs of the chair.Many parents threaten their kids with things but do not always follow through.it is nice to know that Mickey followed through when your sons didn’t keep up with cleaning the cage.I am sure this was a great lesson to them. Thanks for coming by, and for your comment, Dianne. I appreciate that you visit on a regular basis. Let’s have that cup of tea. Great story and photos Norma! Is it snowing in White Rock? It’s really coming down here in the West End! Hi Greg! I just poured your tea… No snow here in White Rock..
Skippy sounds like such a sweet dog. 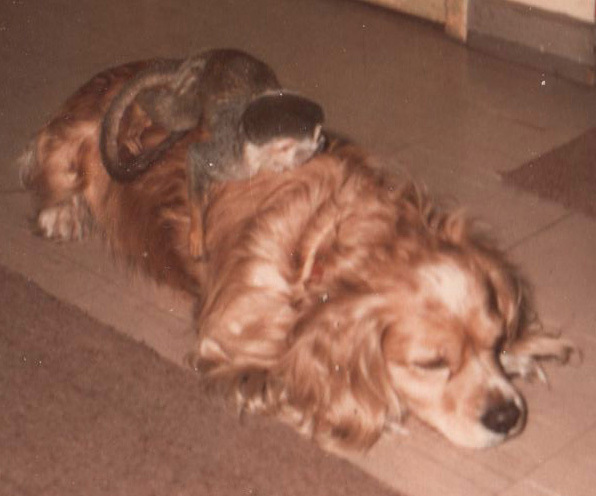 I can’t imagine any dog coping well with a monkey but he was obviously good natured as well as very obedient! He looks like a cocker spaniel??? Do you remember our ‘Perky’, also a cocker? Unfortunately we didn’t have him for long. Hi Carol! 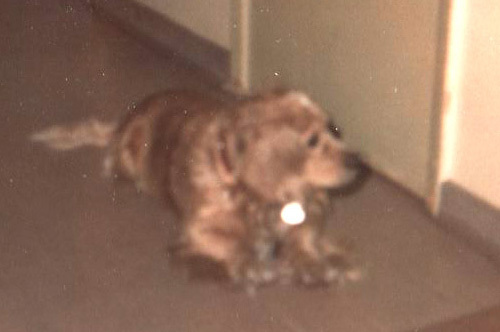 Skippy was a sweet dog. He was a Heintz 57, and the runt of the family. Had little short legs and had to skip to get up the curb. That’s how the boys named him. Hi Heather. Got your cup of tea? Skippy was so smart..One day when we left for work, we got about three blocks from home and saw Skippy. He perked right up as he recognized our car, and then you could see him talking to himself” Oh! Oh! … I’m not supposed to be this far from home!” and he trotted off, heading for home. Thanks sfor the visit and your comment!